It’s Official. I’m In Love! You are here: Home / Workouts / It’s Official. I’m In Love! No, don’t give up hope guys. You still have a chance. It’s not a person, it’s a thing. Today was my very first crossfit workout in a real live crossfit gym. I’ve done a couple of the workouts of the day (WODs) on my own at home, but never with a group of people. 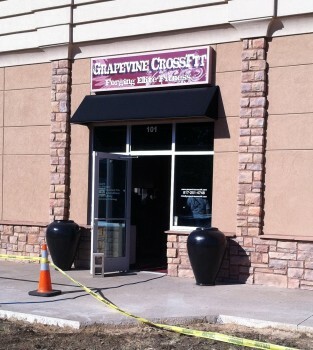 There are several crossfit gyms by me, and one is practically down the street. I’ve been poking around the website of the local gym and saw that they were getting ready to start a new fundamentals class for October. I mentioned it to Trainer Man this week and got the approval to go ahead and give it a whirl. He just advised to watch for signs of overtraining since I’m still lifting hard and heavy with him. You have to graduate the fundamentals class before you can do their open crossfit classes. This is to make sure that you get a good foundation of what you’re doing, proper form and such. So I signed up for the fundamentals starting next week, and then decided last minute to try out an intro class. Today’s class was a free class to give you a chance to try it and see if you like it. Yes, I realize I’m doing things a bit backwards but aren’t you used to that with me by now? I was definitely nervous and wished I didn’t have to go it alone, but oh well. Do what scares you and gitter done. We started out with a 400 m warm up jog and a bunch of side lunges, high knees, and jumping stuff. Not too hard. Then they introduced us to the WOD. Half the class was there for the first time, and it was highly suggested several times that the newbies do the “easier and shorter” workout since the real one would take forever. Drum roll please as I announce my official time… 19:02. Nineteen minutes and 2 seconds. The instructor said that anything under 20 mins was a good time. I’ve no baseline so she could just be saying that as encouragement for all I know, but I’ll take it. I was impressed with myself. I was a solid middle of the pack finisher! The high pulls were a breeze and I definitely could have gone heavier. I opted for 35 lbs since I wasn’t quite sure what to expect in this type of workout. Today is also the day after leg day which can be quite iffy with soreness. Every single push up was done flat back and on my toes. No girl pushups for me. I also ran the entire runs and didn’t slow to a walk. I wore my heart rate monitor and burned about 400 calories during the workout. Yes, I realize that crossfitters don’t wear HRMs, however I still have to report in to Trainer Man on my weekly burn. My heart is a little freaky and beats faster than the typical person during workouts. Probably because I’m highly caffeinated most times. I managed to hit 194 during the last run but that’s not out of the norm for me. It’s been higher. What I now realize is that I just might be an athlete! Yes, me. That word just seems stunning to me but also very exciting. Fundamentals class starts on Tuesday and is three times a week for the next month. I can’t wait! Have you done this WOD before? How was my time? Dying to know. I did it! Tah dah! It's Official. I'm In Love!